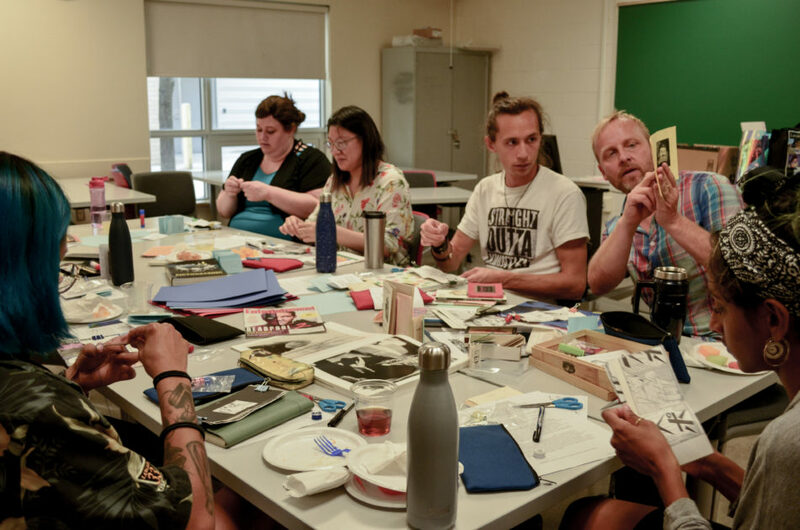 The Kwantlen Creative Writing Guild, a club for writing students at KPU, hosted a chapbook-making workshop with Surrey-based poet Kevin Spenst on Aug. 20. Chapbooks are small paperback booklets which typically contain self-published poems or short fiction. Making and distributing them is an inexpensive way for emerging writers to publish their work. Jennifer Pham, the Kwantlen Creative Writing Guild’s president, says that chapbook making is a “niche” skill that KPU’s writing program barely touches on. Having handmade chapbooks creates a “level of intimacy” between the writer and the reader that she believes is unique. Beyond simply sharing the words they have written, a writer has physically touched and created the book, making it a more personal literary experience for those enjoying their work. For students, chapbooks can serve as either a standalone project or part of a larger manuscript or portfolio. They can be used as a networking tool to get a writer’s work out to the public in an accessible format; They don’t take long to read and provide quick insight into the creator’s style. At the three-hour workshop, all of the materials needed to make the chapbooks were provided for an entry fee of $5.00. Light refreshments were also provided. Participants were taught how to bind their books step-by-step by Kevin Spenst, a local poet with an extensive history of publishing chapbooks. He also provided those in attendance with ample opportunity to enrich their work using their own creative flair. Flip Flop Faces and Unexpurgated Lives!, one of Spenst’s many chapbooks, was printed and distributed by publisher JackPine Press, but was hand-sewn and bound by Spenst and his co-creator Owen Plummer, according to Pham. Even in widely distributed books, self-binding is not a lost art. Spenst, whose other works include Ignite, Jabbering With Bing Bong, and over a dozen chapbooks such as Pray Goodbye and Ward Notes, has a history of visiting KPU as a speaker for various events. His next work of poetry, a chapbook called Upend, will be published soon by Frog Hollow Press. The workshop on Aug. 20 was the first event from the Kwantlen Creative Writing Guild with Pham as president, but it will likely not be the last. There are plans for future workshops to be held on campus regarding performance and “visual poetry.” The guild also hopes to, in the near future, engage participants with interactive workshops that are as captivating as they are educational. If you are a creative writing student, literature enthusiast, emerging poet, or someone looking to try something new, attending one of the guild’s events or weekly meetings is a good way to start forging new skills and creating a network of like-minded individuals.